It’s Day Three of British Flowers Week! And today, it’s the turn of Amanda Austin of Amanda Austin Flowers and her chosen flower, the Astrantia. Your chosen flower for British Flowers Week is the Astrantia. Could you tell us why you selected it? I love their instant recognisability and their ‘tremblant’ nature. They move when you walk holding them. In a bouquet, posy pad, coffin spray or basket which includes them, you can imagine that there’s still space for the butterflies to fly through…something which Lady Pulbrook felt was incredibly important. Astrantia are a fantastic filler flower and my particular favourite is the white and green variety. 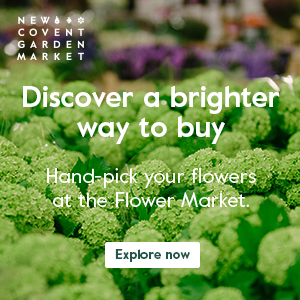 Where do you source your British Flowers? 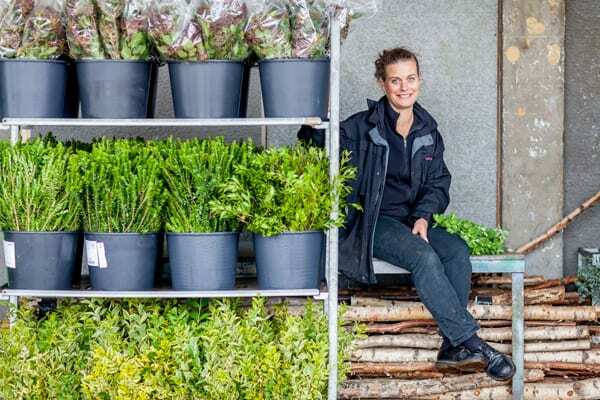 I buy from Zest Flowers and GB Foliage. Could you tell us about the designs which you’ve made exclusively for British Flowers Week 2016? I’ve created a bridal bouquet, headdress, English photo booth and an urn. 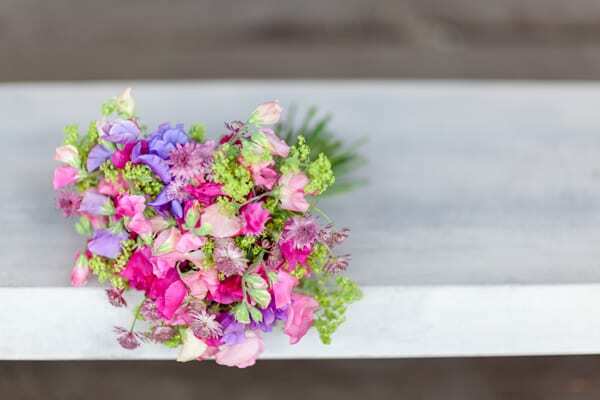 In the bridal bouquet, there’s a combination of purple astrantia, together with sweet peas in pale and cerise pink. 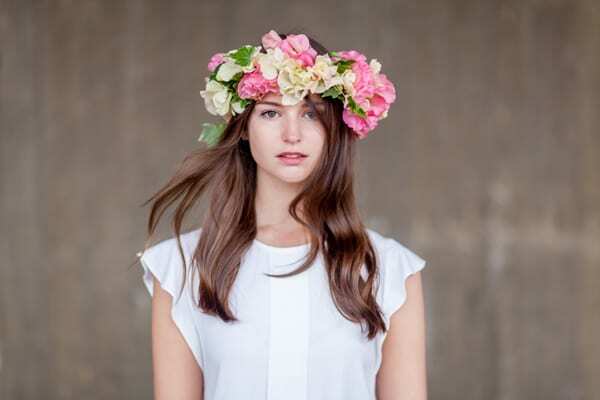 Plus sweet peas and ivy feature in the headdress. 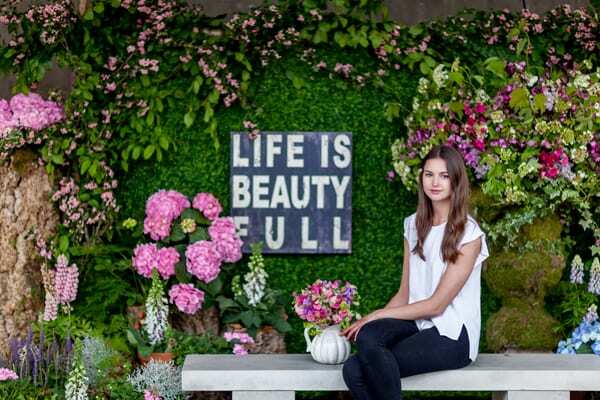 The photo booth was inspired by a show garden at the RHS Chelsea Flower Show, which won a Gold Medal. The Royal Hospital Chelsea, where the show takes place, is very close to our shop in the Kings Road and we do a lot of work there. I wanted to show the link between Chelsea and the Flower Market by including elements from the show garden such as astrantia, foxgloves, salvias, lupins and hydrangeas, together with the semi-industrial feel of the Market by building the backdrop on a Dutch trolley. The whole installation can then be moved around a venue. And it would be perfect to have in place at a wedding or an event. The urn is covered in flat moss, held in place with reel wire. And the floral design features astrantia, alliums, pink campion, hydrangeas, sweet peas, ivy and flowering viburnum. Apart from astrantia, which are your other favourite British flowers? I love sweet peas. They’re a family favourite…each time I have had a child (I now have three), my godmother has sent me a bouquet of sweet peas. Homegrown sweet peas tend to have longer stems than imports, last longer and there’s a lovely range of colours. And people love their scent! 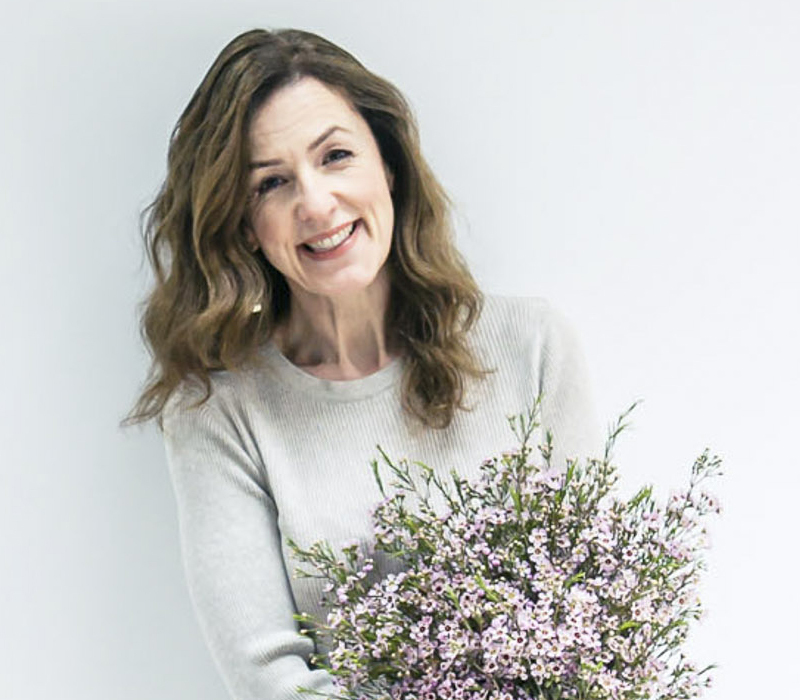 They’re the perfect flower to buy as a pick-me-up, for someone who’s just had a baby or as a present for someone older when you’re not sure what to give. Our customers regularly ask for British flowers. 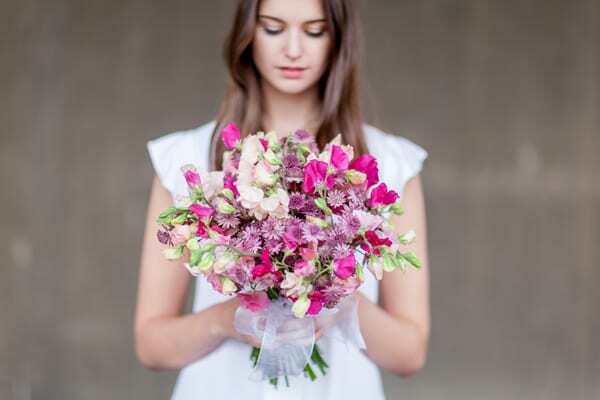 And when they’re in season, sweet peas are our biggest selling British flower, closely followed by lily of the valley. Could you tell us how you’ll be celebrating British Flowers Week? We will be selling a bouquet in our shop and online celebrating British flowers. It will feature astrantia, sweet peas and alchemilla mollis. P.S. 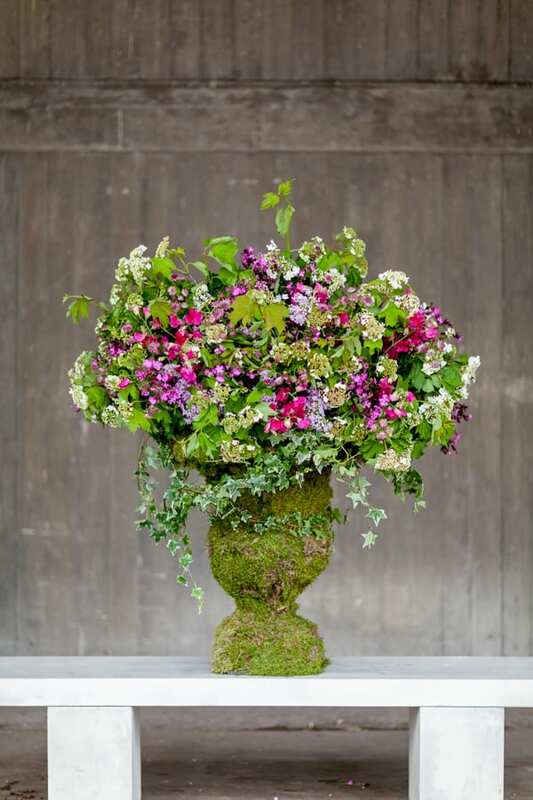 Just in case you missed them, here are links to Day One and Day Two of British Flowers Week.